Being able to tell that money is counterfeit is essential for small businesses. It is becoming easier by the day for criminals to produce counterfeit bills. It is essential to make sure that you and your employees are aware of what counterfeit bills look like. There are small class-offenses and instances where you could lose hundreds of dollars, but there are also other instances when your business can lose hundreds of thousands of dollars. The amount of counterfeit money circulating the United States in 2015 was about $9 million and the United States Department of Treasury estimates there is now $70 million in counterfeit money circulating the United States. According to Wikipedia, these numbers are only based on the amount of counterfeit money that is seized, but the amount of counterfeit money in circulation is actually uncertain. Detecting counterfeit money is the first step to determining you do not become a victim to it. Some methods like counterfeit pens have become outdated as they check for chemicals common in counterfeit bills that were not done with enough care. 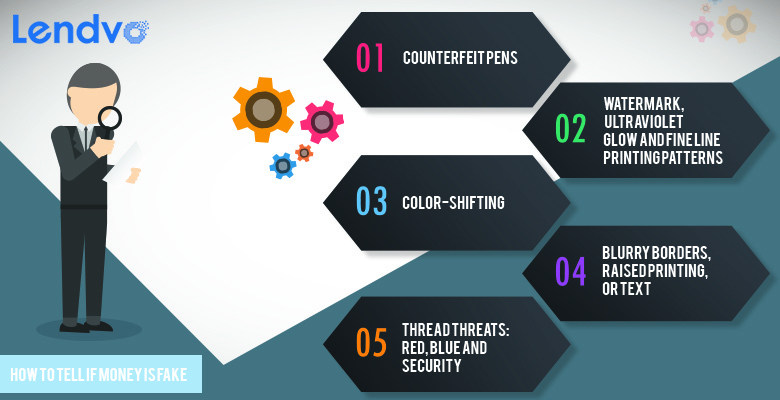 The increase of digital printing has caused some older methods, like counterfeit pens, do not be effective any more and a list of newer ways to detect counterfeit money have become more widely used, as you will see listed below. Counterfeiters in the pats have been known to use techniques that bleach money and alter the bills to look like $100 notes. Businesses can claim losses if the receive counterfeit money, but individuals cannot receive personal funds back if they are tricked into taking the money in the first place making it all the more important to know what to do before putting yourself in that position. .
Counterfeit Pens: Counterfeit pens and color shifting ink both share interesting places in the world of assessing whether money is counterfeit or not. People used to believe counterfeit pens were a good way to analyze whether money was counterfeit or not. Counterfeit pens are actually a very popular way to detect whether or not bills are counterfeit, yet they are no longer trustworthy. In addition to checking the chemicals common in the counterfeit pills done without care, counterfeiters have gotten onto the pens method to the point where they are working their bills so they do not even respond to the pen test at all. Color-Shifting Ink: Over time other methods have developed to check counterfeit money including color-shifting ink that seems to be a more complex technique than using counterfeit pens. Anyone with experience in checking whether a bill is authentic knows to look to see if the bill denomination on the bottom right hand corner has the right color-shifting ink. If you hold a new series bill (except the $5 note) observe the numeral in the lower right hand corner as the color moves to from green to black and back to green. For example, if you hold the $20, the number 20 at the bottom right hand corner now has a copper color when you look right at it, but when rotated and the top of the bill faces down, the bill will turn to a more green color. The difference of copper to green based on how it’s facing was done by the U.S. treasury to make it easier to tell counterfeit. $100 bills also have color-shifting ink that turns green and becomes more visible on a flatter place. If you hold up a light and look at the face image on the bill for a holograph, both images should match; the hologram for Benjamin Franklin will not display on the $100 bill if it is bleached, but it will actually be Abraham Lincoln. Thread Threats: Red, Blue and Security Security threads are one of the most common and distinct authenticity markers of a bill. These are imbedded strips running from the bottom to the face on a banknote and each have unique attributes. The security strip on an authentic bill should have “USA” and the Bill’s denomination (i.e 50) displaying vertically on the bill. The most respected and trusted test in the book is to place the bill under a black like or UV light to assure that it appears as the right color. Watermark, Ultraviolet Glow and Fine Line Printing Patterns Fine line printing patters are patterns that are added behind the portrait on the reverse side scene of a bill meant to make it more difficult to reproduce. The ultraviolet glow is also a new addition to modern printing of bills with is what causes the bills to glow, if they are authentic, the same colors as they are mentioned above. Fine line printing and the ultraviolet glow are in the forefront of the mind of hospitality industry members when they are protecting their venue or establishment from vandals. Small business owners in many other businesses also use these tactics in addition to knowledge on watermarks for protection against counterfeiters. Watermarks allow bills held up to the light to have the watermark viewable in unprinted spaces located to the right of the portrait on the bill. Both sides of the bill depict the watermark because it is imbedded in the paper, but not actually printed on the bill itself. Both images on every bill should match when it is put under a UV light. It can be said that the bill is most likely a counterfeit if there is no watermark or the watermark is visible without being placed near the light. Comparing the texture and feel of the paper of a counterfeit bill to one that is authentic is a common way to tell if the bill is counterfeit, especially by those who deal with cash a lot in their industry.